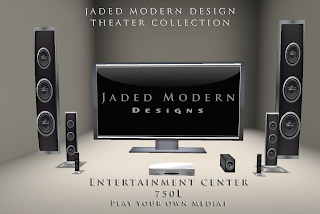 Jaded Modern Designs, The Interior Design Firm. I had to do something for the Gentlemen, they love nice furnishings to! 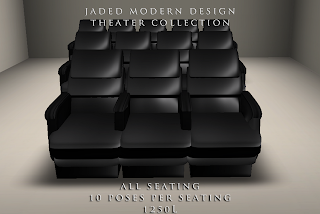 Seating for Home Theaters that will accommodate everyone! Some color options to boot! 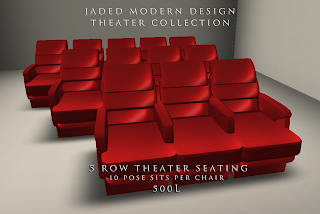 The Sets can be purchased in rows of 3, 4 and 5. I'm really loving how this came about. The Bathroom set is Menu driven for the Shower, tub, and Sink. The set's Decorative items are texture change in order to give you all some variety in your bathroom look! It's still a little bit of summer and left and we all love to entertain! Check out the Patio Collection, the collection includes all that you see here. With lighting with active region control. 42 sit poses was created with the set to the you and your guest variety in sitting. Come on by and check it out! What Is Neveah Up to? Well, I have not had much time to tend to this blog. But! I will make an effort in the next few days! What have I been up to? Custom, Custom, Custom! I've been working on a few high profile client builds that is challenging my design sense! In a good way! 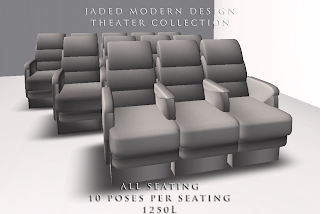 Also, I have been working on Xpose development for a new Furniture line slated for early -mid fall! 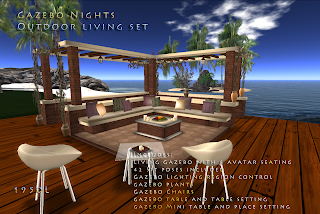 I will add some pitures of reason custom home and furntiure builds to this site as well as shots of the store! 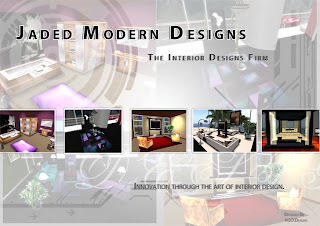 I own a furniture and interior design firm in Second life. I have found SL to be a fantastic outlet for my creativity and it comes out through my love of design. ©Wilder Public Relations Firm, Inc.